Description: As Artie stepped into the horrific scene of his peaceful village torn to pieces, he quickly hides when he hears a monstrous-sounding voice in the distance. Three werewolf-like figures entered the scene; one of them being Cern. Cern is a very persistent enemy. Even when the odds really seem to go against his favour, he just fights his best because he wants to prove that he can. 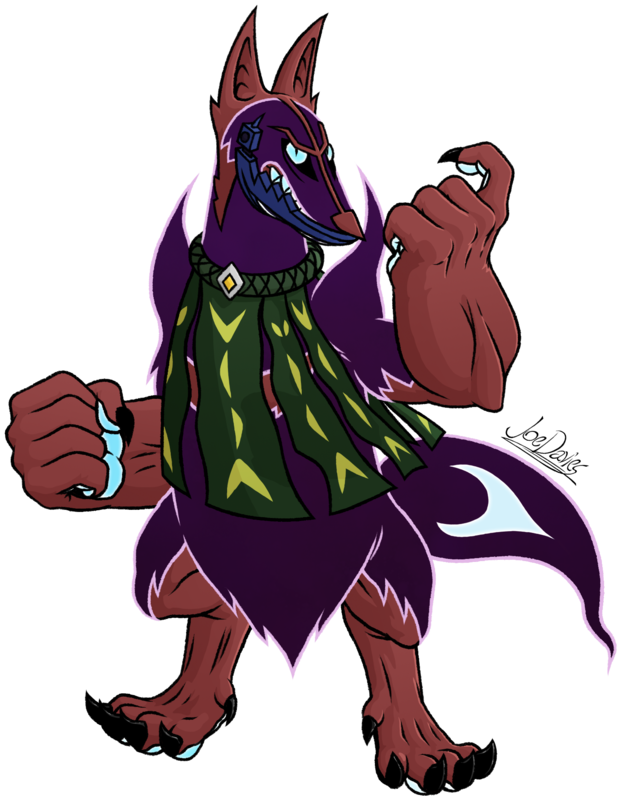 He likes to think of himself as the best of the pack, even though his antics are often the downfall of his comrades’ attacks. Even though he is rarely seen away from both Bern and Usn, he likes to sort matters out himself. This determined but still obtrusive personality of his is why he is bumped down to elite grunt status, when it is to be believed that he and his two comrades were once high generals. Bern and Usn feel no need to be around him when he screws something up, yet they still are seen with him very frequently. It’s unclear as to why. His aggressiveness often leads him into fights with Bern. It is Cern’s show-offy attitude that proved to be his end as he taunted Artie’s new powers a little too far, and paid the price for it. Appearance: Cern is the medium-sized one of the trio. His skin is the reddest of the whole trio as well. The similarities that he shares in appearance with Bern and Usn is that they are of the same breed (golden jackal), and they’re Life Armour (which is what I’m calling them now) is on their entire jaw. His physique and size is rather standard for a Skorned, making him good practice for Artie to learn to attack Skorned. He wears a green vest on his torso, which the pattern of the texture and the negative space resemble snakes. It wraps around his body and suits him very well. – Cern, Bern and Usn are all based on the classic mythical beast; Cerberus, in many ways. For starters, there’s the name. Cerberus is split into three syllables which make up their names. Cern is the first of them of course. – Cern, Bern and Usn are all based on the Golden Jackal breed of coyote because that is what Cerberus was said to be inspired from. – Cerberus was sometimes depicted with more than three heads; sometimes even with 500 heads, but in this case, I went with the classical three-headed dog for this trio’s inspiration. – The Golden Jackal had a reddish hue in its fur, along with its grey coat. This fact was also used to inspire the skin colour of Cern, Bern and Usn. Cern is the reddest of the group. – Cerberus was also to be believed that each of his three heads represented the past, present and future. This tidbit also inspired the design of Cern, Bern and Usn. Each one of them has tail and shoulder fur that resemble flames. The appearance of these flame-like fur pelts for each character represented past, present and future, like Cerberus. In Cern’s case, he represents the present, with his tail and shoulders look similar to a candle-like flame.